In this lesson, you shall learn how to use the Select Case control structure in Visual Basic 2019. The Select Case control structure also involves decisions making but it is slightly different from the If….ElseIf control structure . The If … Then...ElseIf statement control structure evaluates only one expression and each ElseIf statement computes different values for the expression. On the other hand, the Select Case control structure evaluates one expression for multiple values. Select Case is preferred when there exist multiple conditions. 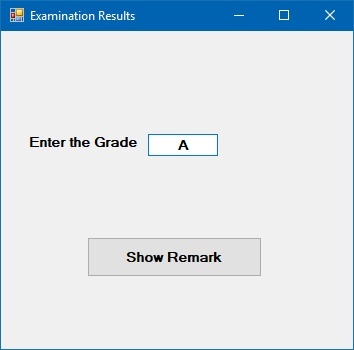 LblGrade.Text = "Error, please re-enter the mark"